The Cabécar, population 20,000 (2014), are spread over a vast territory. 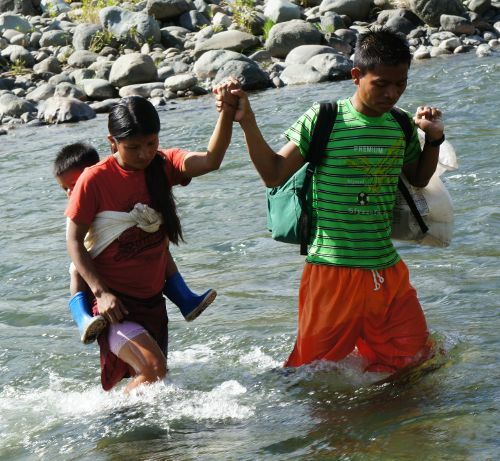 They live without contact with the Spanish speaking population of coastal Costa Rica. Their isolated inland home is very rugged, with rushing rivers and mountains as high as 10,000 feet. Cabécar is also the name of their language, and although the government schools use Spanish, more than 70% of the native people, especially the women, speak only Cabécar. The literacy rate of these people is similar to the third world (30%), whereas for the rest of Costa Rica, the rate is very high at more than 94% (source: United Nations). Until recently the Cabécar were hunters and gatherers, but under the expansionary pressure of the Spanish-speaking population into their territory, they have begun to plant crops, obtaining mixed results. The traditional religion of the Cabécar consists of a hierarchy of spirits, mostly malicious, that are consulted by divination. The Cabécar have a system of purification that, interestingly, is able to help them understand the work of Christ. Many have turned to faith in Christ after realizing that their religion offers them no hope. Today there are more than 900 genuine believers among the Cabécar. In 1952, Aziel and Marian Jones, American missionaries, arrived and began to learn the Cabécar language. As they spread the Gospel of Jesus Christ, they also began translating the New Testament. Aziel and his sons began to establish house churches by means of simple Bible studies. The first New Testament was dedicated in 1993. Unfortunately, in the years since, the missionaries discovered a grave error in the translation of the name of “God.” The word, “Sibo,” is not, as they thought, a generic term for a Supreme Being, but rather the specific name of a pagan divinity. This error caused many new believers to fall into dangerous syncretism. What happened next is told by Timothy Jones. He recounts that after three years of prayer, seeking the will of God, the three brothers each came to the same conviction independently. They burned all of the existing copies of the corrupted translation and, with the support of their parents, began a new translation. They found a simple solution for the translation of the name of “God.” At the same time, they improved the translation using new, better adapted methods. As a confirmation of their conviction, at that time the government introduced a new official alphabet that is easier to read! Today, the Cabécar are still a society with little technological development. 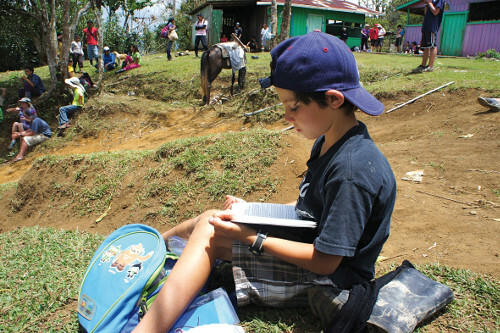 Reading is the favorite pastime of the young generation and many love to read the Word of God. While waiting for the translation of the Old Testament that is still being done by local Christians (supervised by the Jones brothers), the Cabécar are grateful to have the NT in their beautiful heart language. To celebrate with dignity the long awaited arrival of the NT, more than 500 Cabécar met together for two days in the small village of Nãri Nãk at the bottom of a deep valley. Some came from far away and did not hesitate to cross swift rivers. Other women carrying their babies walked two days to come to the celebration! Still others, friends of the Jones family, made the difficult trek, a 3,000 feet descent, under the beating sun, while loaded with tents, mattresses, and food. Among this troop were Paul-André and Jocelyne Eicher, who had been invited to the celebration to represent MiDi Bible! Upon our arrival in the village, we were greeted with a meal cooked over a wood fire in huge pots. Everything was brought on horseback, along with mounds of rice and the famous black beans of Costa Rica. What organization it took to feed more than 500 people for each meal! We roughed it! Some put up their tents before the rain showers; others laid out a makeshift sleeping spot on the floor in the small chapel or settled in a hammock between two trees. The first evening, after a time of worship and prayers in Cabécar, passages of their NT were read by several people of all ages, a beautiful way to show that the Bible is now accessible to all. 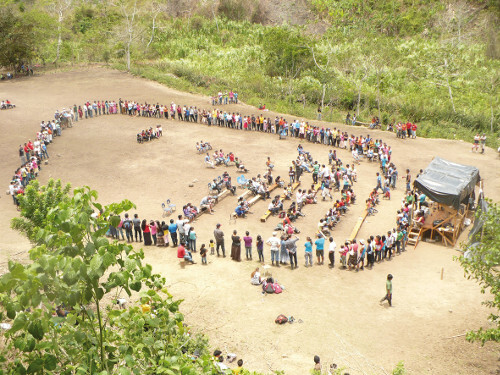 “What an encouragement to see our Cabécar brothers and sisters committed for this dedication. It is the result of all the discipleship that has been done among them,” shares Rebecca, Timothy and Keiry’s oldest daughter. The next morning, Good Friday, was the dedication ceremony and Lord’s Supper. It was a joy to see Timothy with three of his brothers worshipping God together. 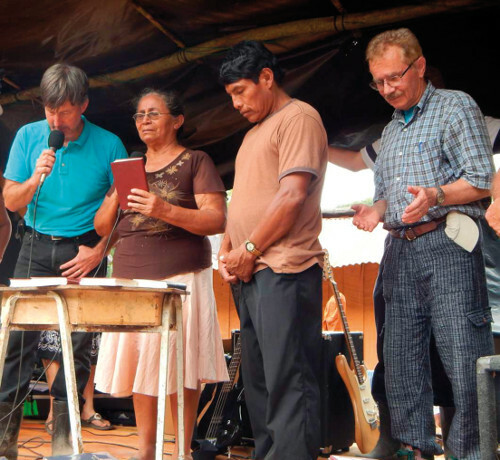 “This dedication is a victory, not only for the NT that our father translated the first time, but also for our family members who have had some difficult moments,” shared the eldest brother. Timothy and his wife presented signed copies of the NT to several who played key roles in the translation. Among them was Timothy’s “adoptive” mother, who spent several years teaching him Cabécar. It was a beautiful gesture of love when Timothy gave her his reading glasses so that she could read the NT at home. Everything was done with humility and gratitude to God. Paul-André took advantage of the occasion to thank each of those who had a part in the translation, for all of the work accomplished, encouraging each one to feed each day upon the living Word of God. On Friday evening, Timothy and his brothers gave a presentation of historical photos of the family’s missionary work started by their parents. The work is not yet finished, as Timothy and local translators are pursuing the translation of the Old Testament (several books have been translated), while his brother David is visiting the Cabécar Christian communities to encourage them in the faith and stimulate them to share their faith and to worship in their own language, the language of their heart, rather than in Spanish.